Texas Housewife: The Joys of the School Year! The Joys of the School Year! So many fun things happen when your kids go back to school. Just over a month in and we've already had stomach viruses, strep throat outbreaks, and the lovely H1N1 scare. We are off with a bang! Now, I'm just waiting for the other unpleasant stuff to happen. Like lice. We haven't personally had to deal with the little buggars for a few years, but ever so often the dreaded note shows up from school saying half the class has it. I hate them so much! I inevitably get them and Dan never, ever does. I usually end up having to chop off my hair and still wage a major battle to get rid of them. I so wish there was a way to prevent them. But wait, there is such a product. Have you ever heard of Zippity Doo products? I hadn't until I was given the opportunity to review them. These products help prevent lice. They are made with all natural products like Tea Tree, Vitamin D, Rosemary, Anise, and more all which help repel lice. 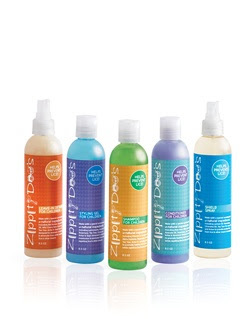 The entire product line includes shampoo, conditioner, leave-in detangler, styling gel, and shield spray. I was particularly impressed with the shield spray which can be used on hats, helmets, book bags, combs, brushes, and even your hair. So, does it work? All I can say is that we've received one note about an outbreak of lice in Ashley's class and she did not get them. The products left the kids' hair soft and manageable. I thought they all smelled very nice, but the kids thought the scent was a bit strong. I also noticed that when the products were used that the mosquitoes tended to stay away as well, which was a big plus for me. So, I give the products a thumbs up. I was very pleased with them. Keep them in mind to help keep the bugs away this year. Hey Nessa! Although I don't have kids, or such it's nice to know about them mosquitos. Living out here we seem to get bombarded with the little stingers! Also rinsing in White Vinegar, will help prevent them.